Since we -the Ogilby family- purchased Hell Roaring Ranch (next door) in 1978 we have known that warm springs exist on the East side of the Crystal River about one mile below the actual Penny Hot Springs. In 1999 we assembled a team of experts to assess the possibility of drilling a hot well on the West side of the highway. The East side, across the river, seemed a more likely location to hit a thermal vein but posed more developmental hurdles due to access. The team gave us a 50% chance of hitting usable hot water at that West side location. This was not sufficient assurance for us to spend the money to drill. In February of 2008, Kayo Ogilby brought two of his high school geology classes from the Colorado Rocky Mountain School to Hell Roaring Ranch to determine the possibility of successful drilling at the west side site. On this field trip the students discovered hot vents coming from under the highway melting the piles of snow along the road. This was a significant discovery, enough to boost our confidence that a hot source could be found on the West side of the highway. That fall, in October, we decided to gamble and drilled a well. To our tremendous relief we hit 96 degree Fahrenheit water at a very good flow rate. In May of 2009 we did a two-week pump test to determine if we impacted the Penny Hot Springs or other vested water rights. Result from the test indicated that we had no measurable adverse impact on the other springs and water rights. In the summer of 2010, we extended a super insulated pipeline 3,020 feet from the well to Avalanche Ranch. By October, we began construction of the pools and mechanical infrastructure for future geothermal heating of all Avalanche Ranch buildings. The pools are designed to completely replenish the stored water in the pools within the state mandated two-hour turnover time with only the raw geothermal water. No chemicals of any kind are added to this natural mineral water. We drain and thoroughly clean each pool every week on Wednesday morning. The pools may not be full and ready for use again until about 1:00-4:00PM on the same day. 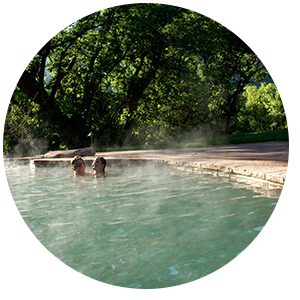 The mineral content of the geothermal water is as follows: measured in milligrams per liter mg/L. As the water flows from the upper tank, the heaviest of the minerals (iron, magnesium, and manganese) form the red layer of travertine. As the water goes over the waterfall and mixes with oxygen, more of the calcium and other minerals form the lower travertine in the thoroughfare stream. 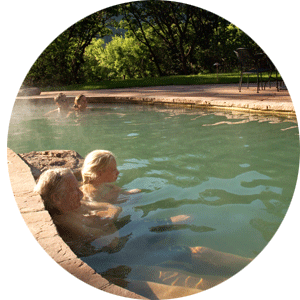 We try to maintain the upper two pools at a temperature of 103 to 105 degrees Fahrenheit and the big pool around 88 to 94 degrees. In the winter and cooler months the covers may be on the two upper pools. If so just pull the cover off and re-cover when you leave. Ready to start your vacation? Begin Here!